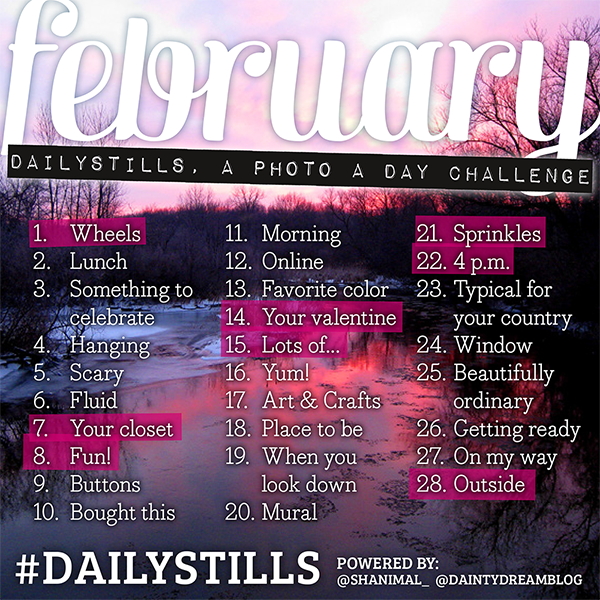 January is over, so it's time to share the Dailystills list with photo prompts for February. Time for more cozy and fun things to do and to make pictures of. So Be Creative and join, it's never to late! Are you joining us in February? Let us know on Instagram :) My IG account: @shanimal_ and Mandy's: @daintydreamblog. You're allowed to save this photo and share it on Instagram too, enjoy! ♥ Take a photo using the prompt as inspiration. So for February the prompt for day 1 is ‘Wheels'. So take a photo from your car, your dream car, a bicycle, you name it!